Seattle’s Torchlight Parade still needs ham radio operators. July 25, 2009, starting about 5pm. Contact: Pat Shinners, w7gto, 206-782-6978. The Torchlight Parade is a SeaFair event. The parade is the largest parade in Seattle each year. 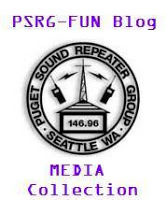 The PSRG gives over primary use of the repeater system during this time for Torchlight use. This event is organized by a few amateurs who are affiliated with the Mike and Key Amateur Radio Club. 2005: This year, the new receiver package was borrowed for the use of the Torchlight Parade communications.